You will receive an email with a link to download the map after the PayPal transaction completes which usually takes about a minute. The link can be used to download the current version of the map until your subscription expires. The map can be used beyond the subscription period but it will be out of date. For personal use, you may install the map on any Windows PC, Mac, compatible Garmin GPS receiver that you own. Garmin BaseCamp is a free desktop application that is used to view the map on a Windows PC or Mac. View the map on your computer. Print or take screen shots of the map. Create waypoints or planned routes to load onto your GPS. Downloading tracks from your GPS to your computer for viewing, saving or sharing. 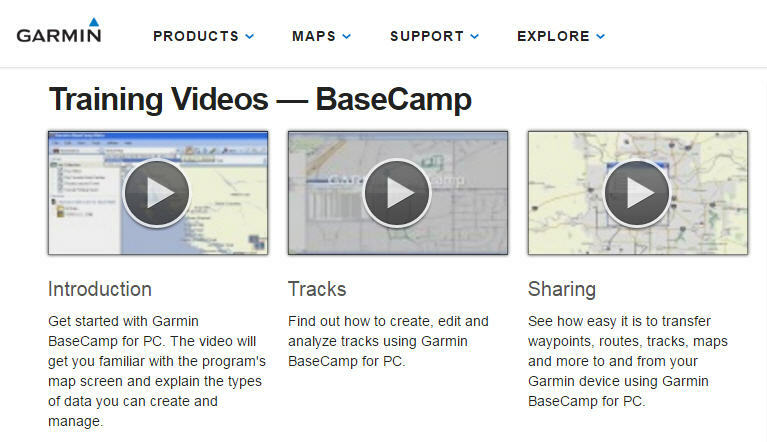 Garmin BaseCamp is used to view the map your PC. Download and install the Windows version of California Trail Map. After starting BaseCamp, you may need to select California Trail Map as the active map. Garmin MapInstall is used to load the map onto your GPS. MapInstall for Windows 4.0.4 will be installed during the map installation. Connect the GPS receiver to your PC using a USB cable. Start Garmin MapInstall from the Windows Start Menu. Confirm that the GPS is recognized and select Continue. Select the maps to install(Land Boundary, Transparent or Topo). Click Install then Install again. The map is now installed on your GPS. Select the the map on your GPS. Transparent map can be used on top of other maps. To update a map, you must first remove the existing version of the map using MapInstall. MapInstall 4.2 cannot be used to load the map onto a GPS reciever. BaseCamp 4.7 automatically installs MapInstall 4.2. California Trail Map will offer to install MapInstall 4.0.4. It must be installed after BaseCamp 4.7. Garmin MapManager is used to load the map onto your Mac. Garmin BaseCamp is used to view the map your Mac. Download and Install Garmin MapInstall and MapManager for Mac. Download the Mac version of the California Trail Map. MapManager launches and the map installation box appears. The maps are now installed on your Mac for use with MapInstall or Garmin BaseCamp. Garmin MapInstall for Mac is used to load the map on your GPS. Install the map onto your Mac using Garmin MapManager(left). Connect your GPS receiver to your Mac using a USB cable. Complete the map installation and disconnect the GPS from your computer. You will need to select the California Trail Map as the active map for the GPS to display. From the map view select Menu. All installed maps are listed. Uncheck the base map, something along the lines of CN North America NT. Verify that the California Trail Map is selected. Select View map and you're ready to roll. Remember: You will need repeat these steps when you want to view the base(street) map installed with the GPS receiver. The map has 7 layers of detail used when zooming in and out. Nuvi receivers will automatically adjust the zoom level based on your speed. Because of this, you may find that the map loses detail when as you increase speed. If you're not getting enough detail, zoom in on the map and the number of features will increase. BaseCamp and GPS receivers have a setting to increase or decrease map detail. You can use this if you want to see POIs, roads or topo lines sooner than they appear by default. Use this with caution because it can clutter a small screen making the map less usable. The map provides search funcitonality but it does not support autorouting. It will not calculate the distance or provide step by step directions from your current location to the destination. Existing routing features of your GPS can be retained by using the Transparent version of the trail map with the street map currently installed on your GPS. Edit the name of a map on Garmin GPS using JaVaWa IMGname. This is useful with GPS receivers that display a cryptic map name. Convert GPX data to a transparent Garmin map. Convert GPX data to a transparent Garmin map using JaVaWa IMGfromGPX. This is useful with GPS receivers that do not support loading tracks.